Wardrobes are often among the most important pieces of furniture in a home. 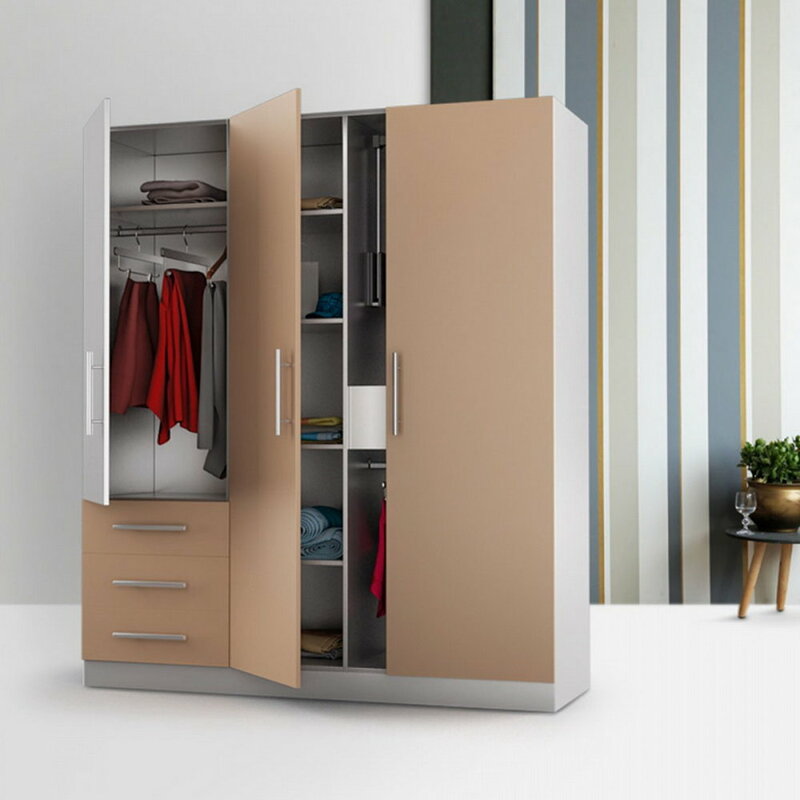 Imagine your room without a wardrobe... where will you keep your clothes and important things? Moreover, how incomplete would it be! And it is not just the presence of a wardrobe, but even how it appears, which matters a lot. A poorly placed wardrobe not only occupies more space but also tarnishes the overall aesthetics of the room and the other decor. If you are wondering about the kind of wardrobe that you must get for your room, here is a full-fledged guide to help you pick the perfect one! In a rush? Jump to our quick visual guide at the end - download, save it on your device and refer to it whenever you want to! The first and foremost point that one must keep in mind is the availability of space. The more space your room has, the bigger can your wardrobe be! For small rooms, compact and small wardrobes are the best because they occupy less space or else it would be congested and the room will look even smaller than it is. On the other hand, if you have a large room and keep a small wardrobe, it would appear odd and out-of-place, not to mention the loss of space optimisation opportunity in such cases. In most metros, space is at a premium, and not utilizing every square inch of space is a grave mistake. Hence, keeping the space in mind is a very crucial point while buying the wardrobe. There is no end to the styles and type of wardrobe you can have. The one thing that matters apart from the size of the wardrobe is the kind of money you are willing to spend on it, vis-a-vis the utility you seek. Lot of factors such as the quality of plywood used, laminate or veneers you choose, the styles, the sort of doors you require - sliding, front opening, with mirrors, etc. It all influences the cost of your wardrobe. The first priority for a wardrobe should be utility and how best can that be achieved keeping in mind the balance between aesthetics and quality. Speak to an expert interior designer who can guide you with what is best suited in your budget. There’s no point having a fancy looking wardrobe of poor quality, which might start giving up on you in a couple of years. What room is the wardrobe to be kept in? What are the colours of the walls, what is the colour of other furniture items? These are some of the questions that matter when freezing upon a particular wardrobe. Pay attention to the theme of the room! Also, a wardrobe made for children will be different than that of adults. For the kids' room, you can opt for a wardrobe that is colourful, with some creatives such as cartoons, superheroes, etc. on it but for an adult, the same won’t work! The best option is to again consult your interior designer as they are better equipped and experienced to visualize the kind of wardrobe which can complement your decor and furniture. Storage requirement is one of the most important factors when it comes to choosing a wardrobe for your room. You will have to think about what all you need to store in the wardrobe, except for clothes... such as documents, valuables, etc. If you are someone who primarily has formals then you will want a wardrobe with enough space for hangers. In this case, look for a wardrobe with enough hanging space. In case you have a huge collection of accessories that need to be stored, go for a wardrobe that has multiple drawers so that you can easily put your accessories in them. Also, do you need a section which can double up as a dresser for you? In this case, you would need a wardrobe with a built-in mirror, platform to hold your accessories, etc. in one place. If you pay enough attention to your storage requirement, there will not be any problem in selecting the perfect wardrobe. The primary function of a wardrobe is storage, hence, it should be kept in mind. A fitted wardrobe can be tailored to suit your needs, including all the features and details you want. It will occupy exactly the amount of space you choose for it. Owing to its custom-made nature, a fitted wardrobe makes efficient utilization of space - it fits seamlessly into any designated area. It is also possible to incorporate fancy lighting right into the design of the wardrobe OR use a section of the wardrobe as a makeshift dresser. It is easier to customise a fitted wardrobe, to complement the decor of a particular room, by experimenting with materials and finishes. Since the wardrobe is fitted along the wall, there’s no space for dust to accumulate in the crevices. Since a fitted wardrobe is considered a part of the house, it increases the resale value - a furnished house is always more attractive to potential buyers. Since these wardrobes are highly customized, they have to be fitted by an expert. Fitted wardrobes are generally more expensive than free-standing ones. Also, if you were to move from your current residence, the fitted custom-made wardrobes cannot be shifted. They can be custom-build or just bought off-the-shelf. Generally they are readymade ones. Freestanding wardrobes are available in a variety of sizes and types, and thus offer variety with respects to cost and design. They are best suited for homeowners who like to rearrange their furniture or keep moving house, from time to time. Freestanding wardrobes leave a lot of unutilized space between themselves and the wall. It is difficult to find a freestanding wardrobe that perfectly matches the decor and dimensions of your room. It is not possible to incorporate lighting fixtures in a freestanding wardrobe. Freestanding wardrobes cause a lot of dust to accumulate - under them, as well as in the area between them and the walls. Hence, you must get the wardrobes for your home only after careful examination of all the aspects. Get in touch with one of Hipcouch's experts today, to make sure you make the best choice! Here's a Quick Visual Guide on the above - You can download, save it for later and ofcourse... Share with friends! Older PostHow To Find Office Interior Designers In Mumbai?